Whilst reading through some papers of Alderman (and later, Mayor of Manchester), Wright Robinson held in the Manchester Record Office archive, I came across a copy of an unpublished account that he had written about his involvement in a case concerning men who were in a trade union in Liverpool during the First World War. They were claiming exemption from fighting because they wanted to be treated as conscientious objectors, on moral grounds. I also found amongst the same papers, a typed transcript of some of the proceedings and a copy of a broadside giving information on the case and appealing to “all lovers of liberty, anti-conscriptionists and those who believe a private soldier has the right to legal treatment” to support the men. The case concerned two trade unionists from Liverpool – Charles Dukes and George Beardsworth – who wanted exemption from conscription because of their strongly held, moral beliefs. They wanted this to be recognised as grounds for exemption similar to that granted to men who had deeply held religious objections to fighting. The case was a very complex one, because the soldiers actually wanted to appear before a Court Martial, so that they could argue their case, but initially this was not allowed. There followed several questions in Parliament about this, as well as about the brutal treatment meted out to the two men (amongst others). They were eventually granted a Court Martial and found guilty of refusing to follow orders and sentenced to 2 years in prison, with hard labour. However, there was also an independent enquiry into their treatment before the Court Martial took place. From contemporaneous statements, transcripts, memoirs, Hansard entries and newspaper reports, I managed to piece together a very complex but interesting, little-remembered attempt by ordinary men to hold on to their beliefs under intense pressure to conform. In this, they had tremendous help and support from Wright Robinson, who at the time was editor of a socialist paper – Liverpool Forward, and an ILP organiser and Trade Union Officer. In 1916, volunteers to join the British Army were dwindling and so the Government introduced conscription, whereby men had to serve their country in the military for a specific period of time. A clause was added allowing those whose “conscience” did not allow them to bear arms, to be freed from military service – for example religious objectors who believed it was against their religion, such as Quakers, or pacifists who were against war in general. Many Conscientious Objectors (COs) did want to do “their bit” however, and became stretcher bearers or helped in factories. However, some refused to do anything at all that was involved in the war and these were known as “absolutists”. The No-Conscription Fellowship, which supported Beardsworth and Dukes, was an alliance of the Socialist Independent Labour Party and Quakers. In all 5,970 COs were court-martialled and 819 spent over two years in prison; indeed, 73 were known to have died as a result of their treatment, including another Birkenhead man – Walter Bone, a “book finisher”. He refused to sign up and was sent to Winchester prison where he died of pneumonia on 23 February 1919 after a year and a half in prison and during which, fellow prisoners constantly pointed out that he was a “physical wreck”. It seems tragic that he was still being punished even though the war had been over for nearly 4 months and he actually died in peacetime. Both Liverpool men were called up in August 1916 and told to attend Birkenhead Barracks. Beardsworth did attend as requested but once at the barracks, refused to obey any orders, e.g. to attend parade, to wear khaki or to sign anything at all. I have found his enlistment papers which clearly show that he “refuses to sign”. He maintained that his objection was for moral reasons. Both men suffered very brutal treatment when they refused to co-operate with the military, which in the case of Beardsworth, was witnessed by many people because some of it was in a public place. They were brutalised, beaten, forced to march with heavy packs, humiliated and kept in solitary confinement. During this time they repeatedly asked that they be called before a Court Martial, so that they could state their case. After a lengthy fight, in which they were supported by Wright Robinson, various Trade Unions and the Liverpool ILP, among others, they were eventually called before a Court Martial, as they had repeatedly requested (October 1916). It was the first to be held on Conscientious Objectors at Birkenhead. Wright Robinson wrote extensively about the court martial, the notes of which I found in his papers. It would seem that the men argued that they had held anti-war opinions BEFORE the war and that they had always been sincerely held. They said their moral convictions were just as binding and genuine as religious ones. 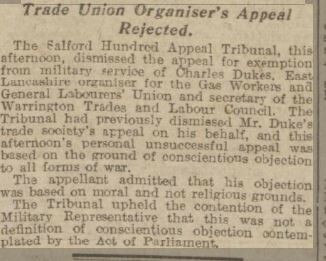 The tribunal were unimpressed, especially as the men were trade unionists. It was even put to Beardsworth that as he was a socialist and trade unionist, he supported reform by force, therefore he could not be a pacifist, to which he stated “there is a vast difference between the withdrawal of labour and the force required to kill a man”. He noted that hundreds of men had been granted exemption, many of them Quakers and asked the Court “will you not agree my objection is an equally moral one?” the reply to which was that they could not agree and that his objection was a political one and that this did not allow exemption on grounds of conscience. Indeed, they described him as a “socialist of the deepest dye” – one suspects this was NOT seen as a compliment! As well as his own notes on the case, I discovered that Wright Robinson was mentioned in the trial transcript; he was called as a character witness and emphasised that he had known Beardsworth for 8 years and that Beardsworth had always held clear views and convictions that all war was wrong and that he had even taken part in pre-war campaigns against war – believing that working men should not fight working men, even if they were from another nation. Wright Robinson also offered his support to Dukes. He notes in his unpublished partial memoir that “Charles Dukes now walked into the story as a living personality” and describes him as “a strong man, over 6’ in height”. Dukes, a former plasterer and Trade Union Official, had also suffered abuse and brutality. When the Tribunal pointed out to Mr Robinson that the Labour Party supported the war and thus Trade Unionists should, he replied that the Independent Labour Party did NOT, as it was a Socialist organisation – I found this quite interesting, as I did not know anything about the ILP and Labour, assuming they were similar organisations – it would seem this was far from the case. On 12th October 1916, both men were found guilty of not obeying orders and not turning up to parade and sentenced to two years’ imprisonment with hard labour because they refused to do any work connected with the war. 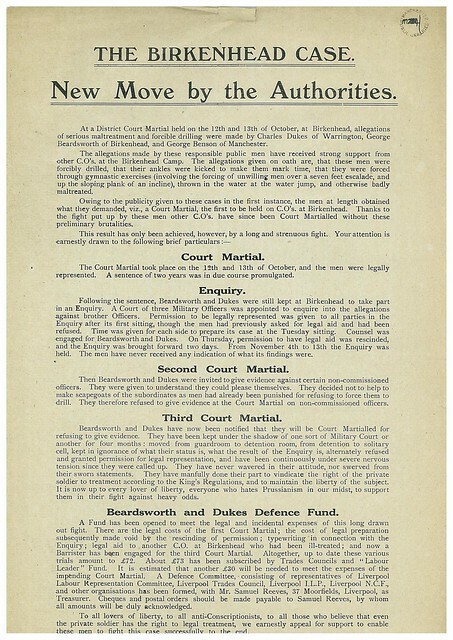 I have found the military records of both men and it seems that Dukes did not serve the full sentence as he was released in 1917; Beardsworth did – he was released from prison exactly two years after his sentence began (October 1918) – however he was released under oath to work for the Commission on Employment of Conscientious Objectors at Wakefield. He was officially discharged from the army on 31st March 1920. There was also an Enquiry by the army into the brutal treatment of the men before their Court Martial. Again, Wright Robinson and various other individuals and organisations gave the two men both moral and financial support. I have found the notes on this in Wright Robinson’s papers. The two men refused to give evidence against the perpetrators as they said that it was the institution of the army, not the individual soldiers who were to blame. Unbelievably, they were then court martialled because they refused to give evidence! But since they were already under a sentence and imprisoned, this was dismissed. However, at least the case and evidence was heard, which I would like to think helped bring the treatment of COs into the public domain; indeed I have found many contemporaneous newspaper articles, letters and accounts in Hansard of questions being asked in Parliament regarding their treatment following the outcome of the Enquiry. So the men’s brave stand must have helped the plight of COs greatly. Also, due to the publicity of the case, many other COs were allowed to state their cases in front of a Court Martial. This is a great example of how two ordinary men stood up for their beliefs, with the help of others, and took a brave stand – but then disappeared from the history of World War 1. I hope this small piece of research helps bring them to life again and allows us to appreciate the many different facets of the war and how individuals’ actions, bravery and beliefs are also part of the experience of war, even when not involved directly on the fields of battle. The three men mentioned above all went on to be very successful in public service; Beardsworth worked in the trade union movement from 1919 and was awarded an OBE in 1950 for his trade union work with USDAW; Dukes was awarded a CBE in 1942 and became General Secretary of the NUGMW during the vital period before and after the Second World War (1934-46) (including presidency of the TUC in 1946) and Director of the Bank of England in the important post year period (1947-48) He was created a Baron at that time. 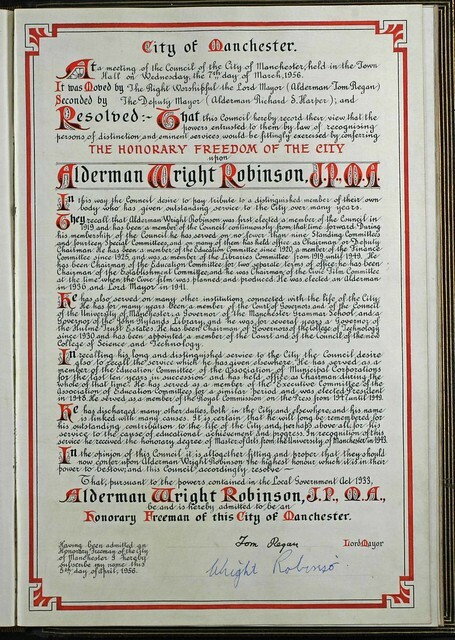 Wright Robinson became an Alderman just after the First World War and remained in public office until 1956, when he was awarded the Freedom of the City. He was also a JP and became Mayor of Manchester during the Second World War. He had retained his strong socialist principles and declined a Barony and OBE in 1945 and a CBE in 1956. I think the post Great War history of these men, somewhat against popular notions, shows that the public did not always shun men who had been conscientious objectors during the First World War. On the contrary, when these men offered their services to the public good, they were welcomed by their communities and local electorate and their efforts were vital to their country during the Second World War, a fact that was recognised both at local and national level. A fitting and positive end to their stories! I work at the Galleries of Justice museum in Nottingham, I’m researching the Birkenhead conscientious objector trial for an education project. I will be creating a mock-trial for school groups which will be used to educate children about conscientious objection during WW1: particularly those who objected on moral grounds (rather than religious). Do you have a copy of the transcript of the original trial? If so I would be extremely grateful if you could email it to me. Thank you so much. Hi Gaynor. Thank you for the link. I’m not really near Manchester – I’m based in Nottingham. Is there any way you could photocopy the transcript of the trial? I can give you the postal address. I wonder if you have any more information about the third name in the case George Benson? His names does crop up in connection with Dukes and Beardsworth, but the subsequent accounts of the courts martial seem to only focus on those two. I know Benson was imprisoned as a CO during the war. I’m interested in George Benson as he went on to become the MP for Chesterfield ( where I live), although by all accounts he was a pretty mainstream Labour MP, unlike Tony Benn who much later represented Chesterfield, it appears that his experiences as a CO in prison did lead to a lifelong interest in penal reform and he did for a while serve as the chairman of the Howard League for Penal Reform. I am involved with a group in Chesterfield who are carrying out research into COs and am interested finding out anything else i can about George Benson.